A kind of bearing containing oil as a friction contact when fan is rotating. Its disadvantage is the contact of the bearing gets rough and dry when the oil is leaking or less after certain period of use. The unsmooth contact results in high temperature, abnormal noise and then causes the cooler totally out of order. The life in use of this kind of fan is about 1/2 or 2/3 of ball bearing fan which is around 20000~30000 hours. n the bearing there are several little steel balls around, so when axle rotates, the steel balls rotate too. As it's round, its friction is also less than sleeve bearing design. You can also rule out the disadvantage of leaking oil, so the life in use is longer. Generally 40000~55000 hours. However, its cost is higher and that's why a cooler with ball bearing fan is about US$1~1.5 dollars more than sleeve bearing cooler. Can't know. Unless you tear it apart to have a close look of inside parts, otherwise you won't know. You would also be cheated by the label if the maker intends to lie. This is why a brand cooler is important. What matters about a good cooler is its overall design and compatibility to what CPU you use. It's not only about a powerful fan or a quiet fan or a fan with whatever kind of clips and heatsinks. Fan makers may offer cooler with better price, but if the cooler they offer can't reach your requirements, do you think they would change their fan and turn to some other fan suppliers? The answer is clear. 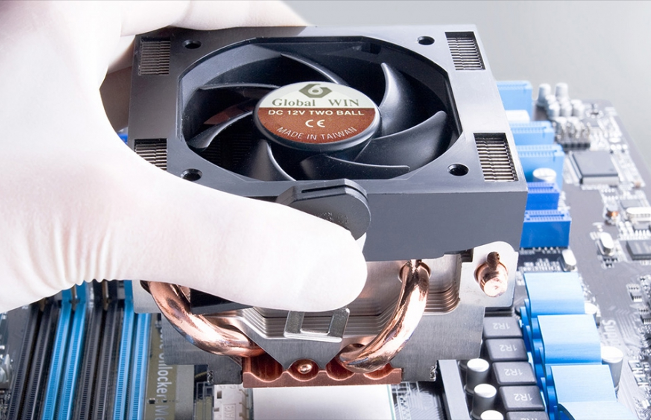 Global WIN specialize in the overall performance, so we care for cooler's performance always under a total consideration of fan life, heatsink performance, clips and the kind of CPU you use, budget you have of course.